North Cross Shaft, South-East view. North Cross Shaft, South-East view. The cross is dated to the early ninth century. This shows the top of the shaft. 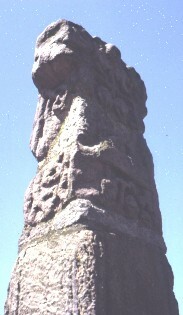 On the east face there is the remains of a figure on the cross head, and at the top of the shaft there is a panel which is difficult to identify. It is suggested that this may be the Baptism of Christ, New Testament, Matt. 3; Mark 1; Luke 3; John 1:32. On the south face there is interlace.